Benjamin Lachelt ’20 places heavy importance on his surroundings. Lachelt left the mountains and canyons of Durango, Colorado, in pursuit of an education through the University of Redlands’ Johnston Center for Integrative Studies. With an emphasis in urban studies, geography, and anthropology, Lachelt studies cities, from the planning and development processes to the current state of metropolitan areas and whether or not people enjoy inhabiting them. Lachelt is a community assistant in the basement of Bekins Hall, a position that allows him to witness and influence how students live within the Johnston community. 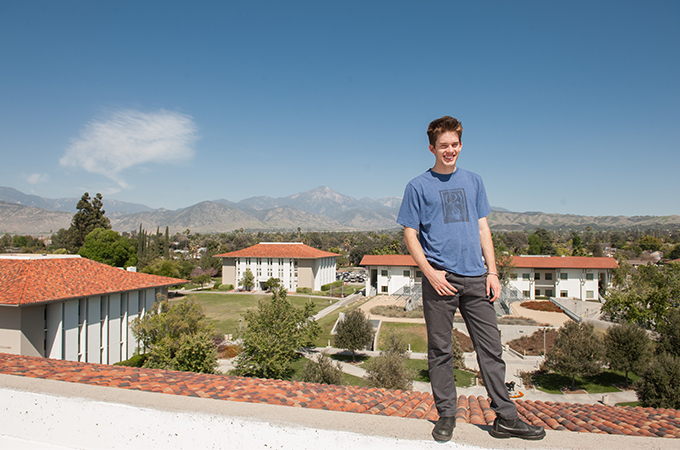 Previously, Lachelt worked with the Associated Students of the University of Redlands (ASUR) to plan events on campus, including a lecture given by Nick Martini, a professional skier and film director. “Building relationships across campus has been very rewarding—I enjoy having agency in the place where I live,” says Lachelt. Lachelt is looking forward to embarking on an urban studies-focused study abroad trip, which will take him to New York City, Buenos Aires, Barcelona, and Cape Town. “The collaboration between the Study Abroad office and Johnston has allowed me to pursue knowledge and education in a way that is extremely meaningful to me,” he says.